Haven't got out much this week so thought it was time for a bit of self indulgence and another look back at my childhood enthusiast days. In the last post we had reached 1977 when I started secondary school, which is when I realised what a variety of vehicles there were. 1977 and 78 saw new batches of Bristol VR's and Leyland Nationals but in 1979 things started to get interesting. 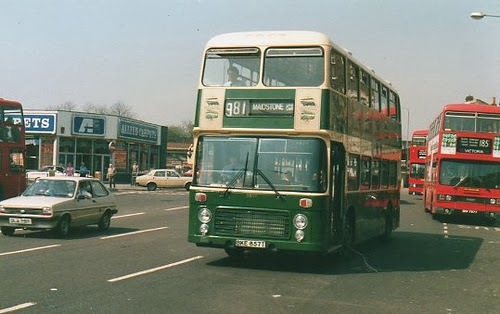 I remember standing in Rochester waiting for the second of two buses home from school when I noticed a brand new Leyland Leopard coach on my route going the other way. And then another one, going the right way! There were in fact seven of them and I became very familar with all of them. 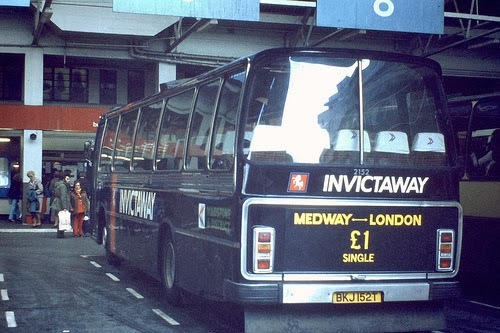 Not strictly sticking to chronological order as I'll be doing an Invictaway special in due course, but any excuse to show a pic of the livery all 7 were soon to be painted in - they even still turned up on my home route in it on occasions. 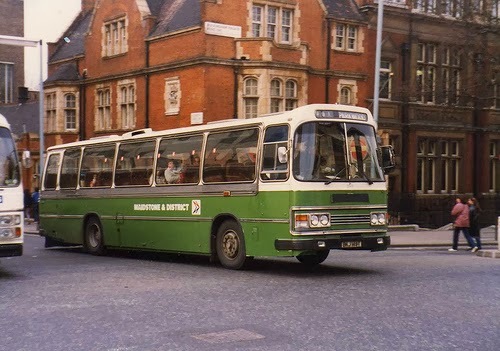 Another feature of 1979 was yet another batch of Bristol VR's - 32 of them to be precise and they were truly divided up around the depots with, if memory serves me correctly, Hawkhurst, Maidstone, Tunbridge Wells, Borough Green, Hastings, Silverhill and Gillingham all receiving some. It's worth noting that only Tunbridge Wells and Gillingham depots still remain today (Maidstone moved to the former Boro'line depot). 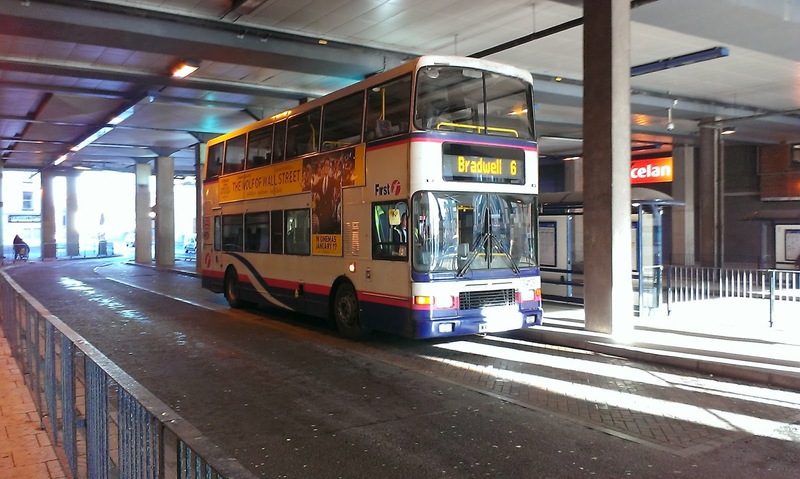 This batch included my all time favourite Bristol - 5857 BKE 857T. The engine made a sublime throaty noise and for a Bristol she flew. I make no apology for posting 3 pics of her in very different liveries, the last of which came as a complete surprise to me. I have just discovered that 5857 was destroyed in an arson attack at Truro depot on New Years Eve 2005. I'm in mourning. Further research has revealed that no less than 9 of this batch of Bristols still survive 35 years later. However it would take quite a jaunt around Europe to catch up with them all as there are vehicles in Belguim, Poland, Italy, and Spain! I had no plans to do this when I left home this morning. but when I got to Norwich I saw an Olympian pass me and cursed my luck that I hadn't seen it coming to get a pic. 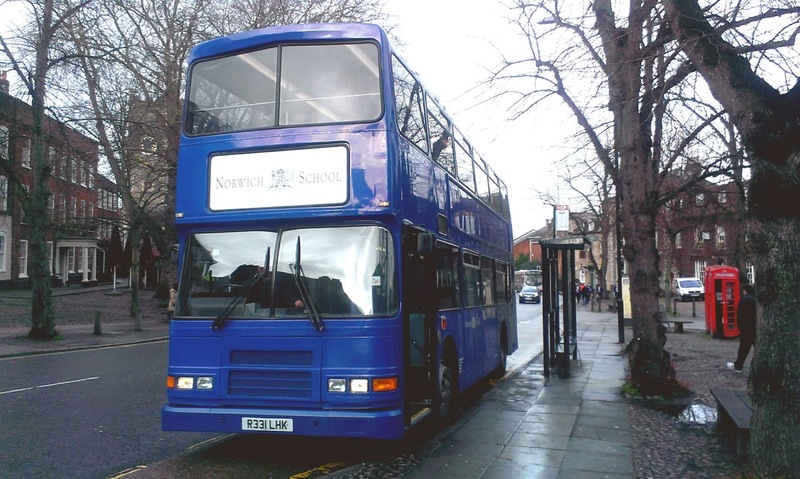 Painted Royal Blue with white Norwich School livery (Ipswich Town FC colours). An hour later I was near Anglia Square and I heard a sound that really was music to my ears. 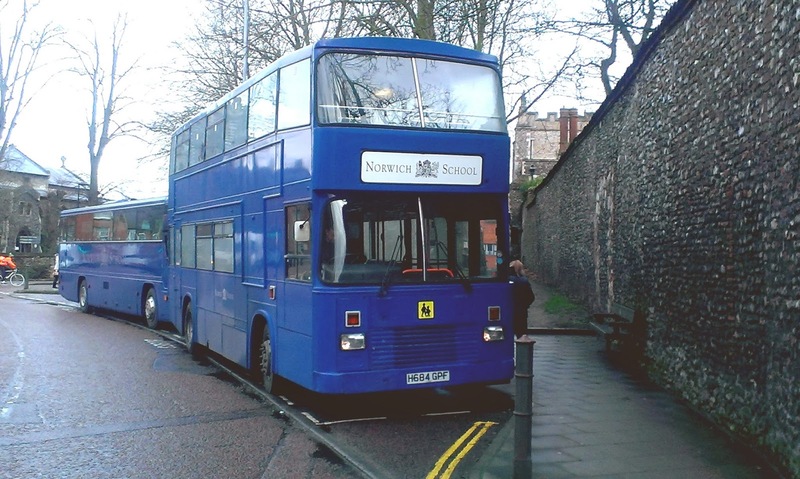 Having driven Volvo Citybuses I know that sound anywhere and sure enough there was the rear (again) of another Norwich School decker. Having killed the time before my lunch venue opened I walked back up the hill to see a Norwich School coach parked up outside the Cathedral. So after lunch I got to work. 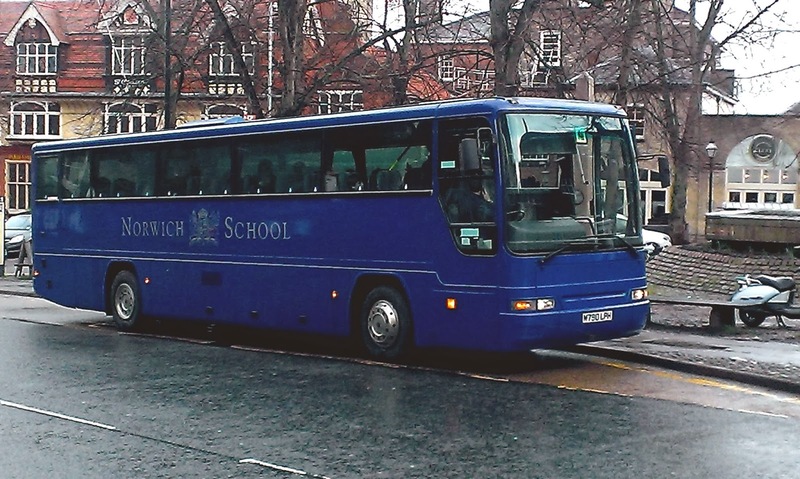 Got a good pic of the coach, which is a former Epsom Coaches Dennis Javelin, then the Olympian pulled up, whch is an ex Dublin vehicle. 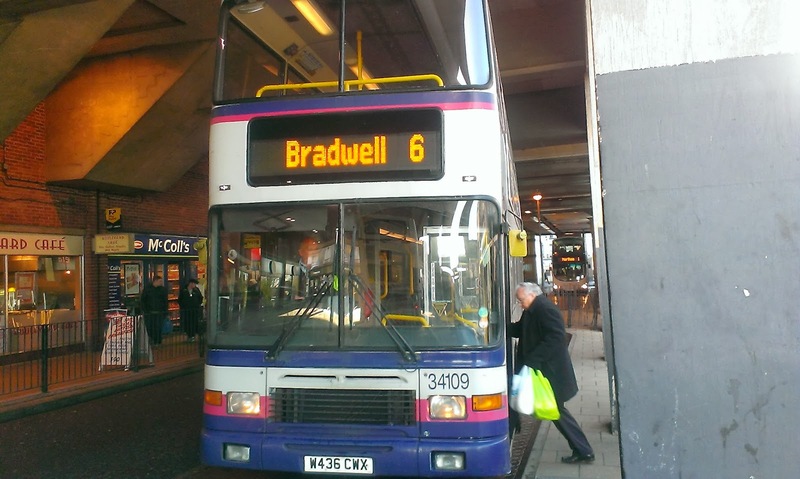 The driver, bless him, told me where to find the Citybus, which it turns out was parked up just round the corner. H684 GPH, new to London & Country operating in Central London, the driver kindly let me have a quick look on board before the kids finished their hockey and the smell brought a lot of memories back! There is another Citybus currently in the workshop from the same batch H653 GPH, so quite an impressive fleet for a school, especially as I also spotted two pretty new Ford Transit minibuses too. Have to admit my school never had anything that exciting! This blog has just recorded its 10,000th page view. This has been achieved in 95 days and no one is more surprised than I am. I'd just like to thank everyone for reading, especially those who comment - even if I don't agree with them I'd rather have comments I don't agree with than no comments at all - debate is healthy! I have also met some really decent people through the blog and above all it has given me the motivation to get off my backside and get out there doing things. Thanks, all and here's to the next 10,000. Before my sojurn to Norwich I had been in Great Yarmouth in hunt of that increasingly rare and endangered species the Volvo Olympian. Actually drove up there to get to Market Gates in time to catch 34186 on its usual 1050 departure to Belton. Everything went like clockwork right up to the moment 33212 turned up on the 1050 to Belton. All was not lost though as 34109 turned up on ITS usual 1105 to Bradwell, so I had a very pleasant 45 mins or so trundling there and back. No sign of 34108 though so if that now has a regular diagram can someone let me know please. I mentioned in a previous post that luck plays a good part in spotting and I had some more after I got back from Norwich. Got in the car, promptly took a wrong turn, went long way round to heading home and glory be came out of a junction right in front of 34186 on a contract journey. Foot down, get ahead, pull over, grab phone and snap - got a beauty. Thanks, fate! 34186 approaches on its contract run - can I get a better shot? Yeee Haa!! We got ourselves a CONVOY! Two X1's in a convoy along the Acle Straight - Convoy!!! 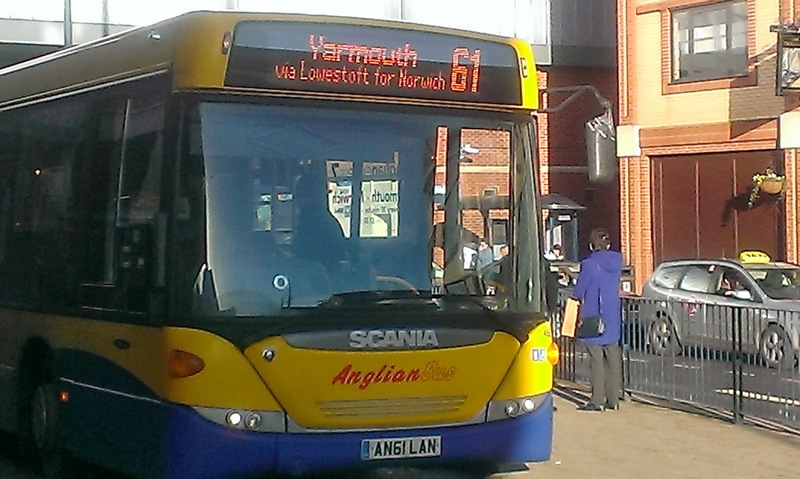 A bit of poetic licence there as it was all the way from Norwich to Yarmouth! I had caught 33815 (no comment) to Norwich just to kill time and after sampling the Norwich atmosphere and taking a couple of pics realised that I had a choice of X1's back. A late running 33818 or 37572. No contest so I got on 37572 and we followed 33818 all the way to Acle - never more than 100yds behind it despite the E400's alleged speed advantage, overtook it at Acle and got to Market Gates first. Spent the whole journey thinking up those lyrics! 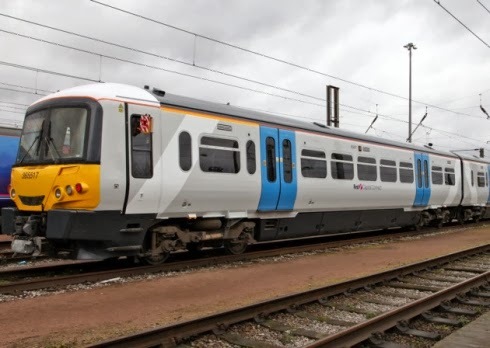 As a side bar on the way to Norwich I saw a very red faced Anglian driver who had obviously forgotten the 7 now goes through Acle as he had completely missed it Yarmouth bound, so went through Acle the wrong way, did a U-turn at the roundabout and managed to look as though he meant it all the time! Market Gates and we arrive first followed closely by 33818. Inciderntally when was the last time 60813 saw a wash? Sometimes you just have to be in the right place at the right time. Most of the time that happens purely by chance. Today was such a day. 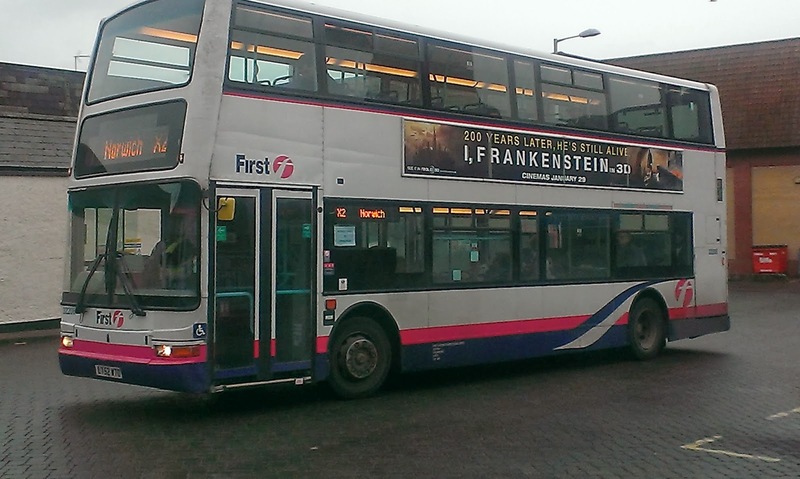 There I was at Tower Ramparts in Ipswich waiting for the X1 to come in and I look up to see a monster bearing down on me in the shape of Suffolk Norse's Tri-axle Dennis Dragon M686 TDB. Managed to get a pic of it in the nick of time and was feeling pleased with myself when glory be one of Norse's new E400's comes along with to crown the trio an Olympian behind. All full of school kids blissfully unaware of how lucky they were! I have done some research on the Dennis Dragon. I assumed from the name it was built for the Hong Kong market, and it appears initially I was right as they were designed for the Kowloom Motor Bus (HK) and Chinese Motor Bus - the Chinese models were called Condors as in 1982, when these vehicles were derived from the Dennis Dominator, to call it the same as the HK models would not have gone down well. But M686 TDB was not built for either HK or China. 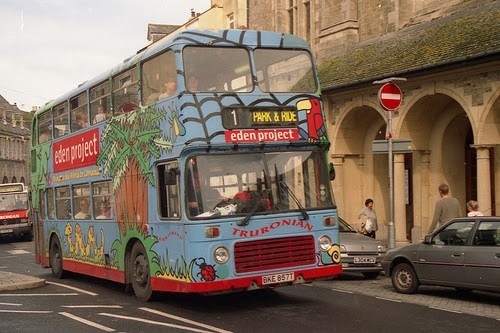 It is one of 20 built for Stagecoach in Kenya in 1996. They didn't last long in Africa and by 2000 they were all in Manchester operating Magic Bus services and later Megabus. 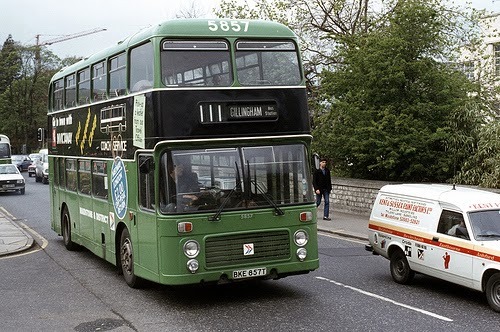 M686 TDB was numbered 15186 and was sold to Ensign in 2010. Really good to see a bus with so much history and I bet none of her young passengers today realised where their transport originated from. 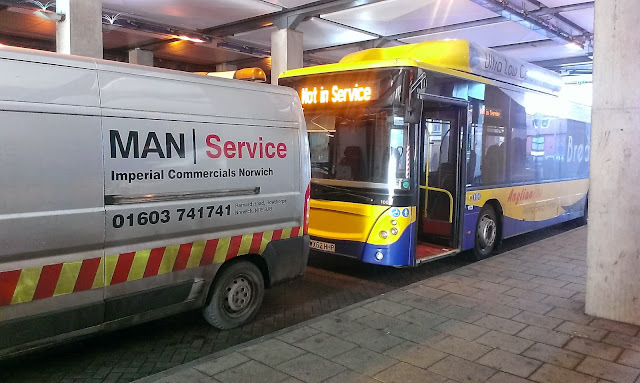 In my humble opinion two of the best looking deckers around are Ipswich Buses 2 Scanias with Optare Olympus bodies. I thought they looked awesome 3 years ago and I still do. 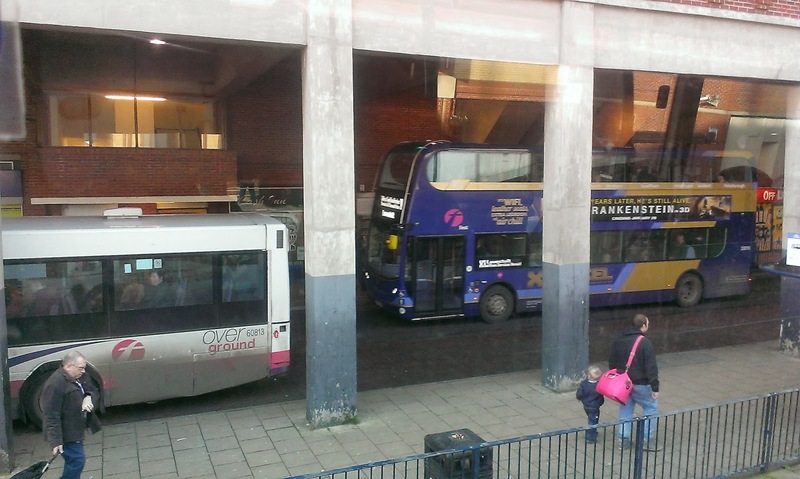 I was lucky enough to see them both today - one on its normal 9/10 Whitton route and the other which is almost unheard of on the lunchtime Free Shuttle duty. I took advantage and had a trip on it and the driver, who must be dizzy the amount of times he drives around Ipswich in a circle every year, confirmed that he could count on the fingers of one hand the number of times he had had one of those Scanias. One is in the new livery, the other isn't so it is easy to compare the two liveries and choose your fav. I wasn't sure at first but the new one is beginning to grow on me, and Scania 69 I think looks really good in the new colours. 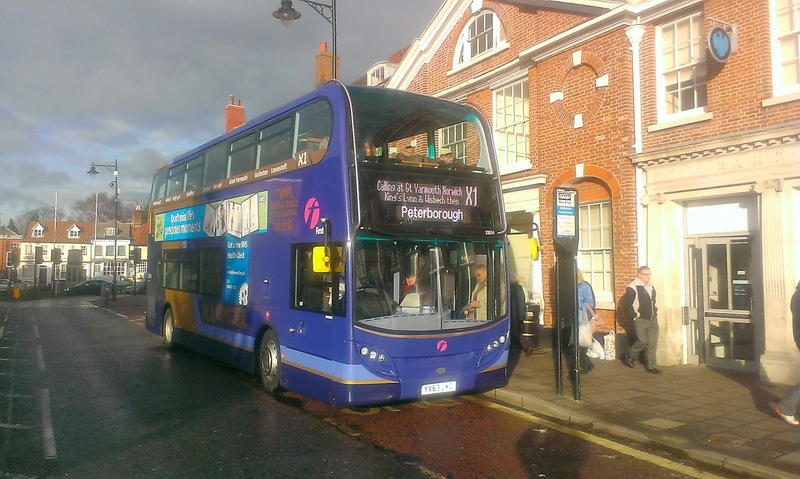 With everyone busy watching Stagecoach to see if they will try to get their hands on the X1, what has slipped under the radar is another X1 has been launched by Ipswich Buses. The comparison is interesting to say the least. 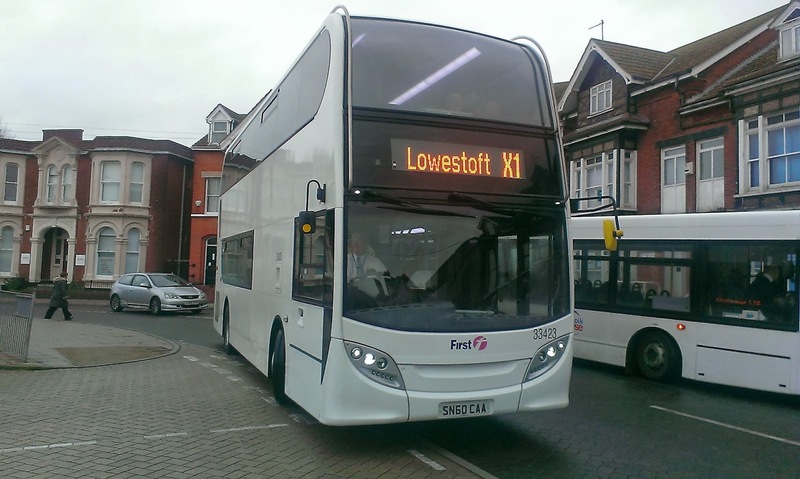 First's X1 requires a fleet of 22 vehicles, and a round trip takes 9h 38m. 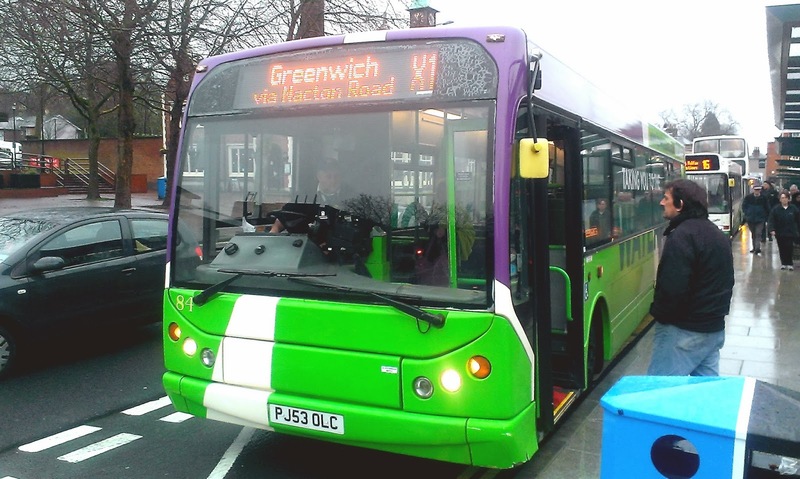 The Ipswich X1 requires 2 vehicles and a round trip takes a mere 38 mins. 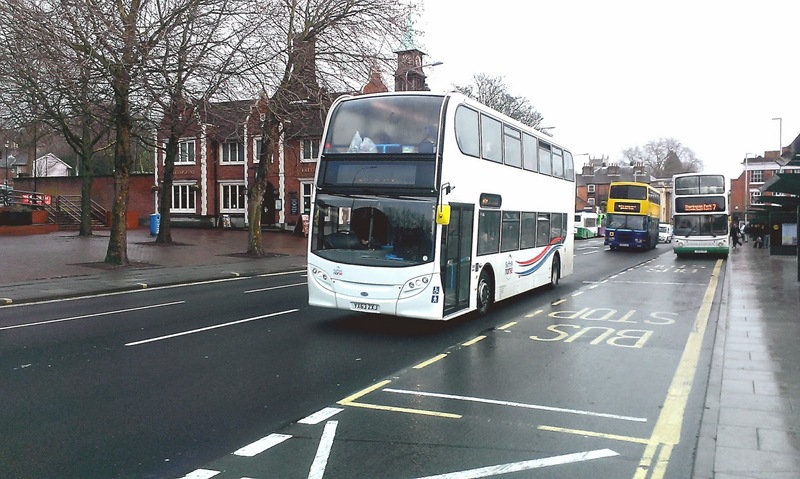 It has been set up to mirror First's 61 in response to First competeing against IB's flagship 13 service. All good fun. Anyway i finally got to Ipswich to get a few shots today. 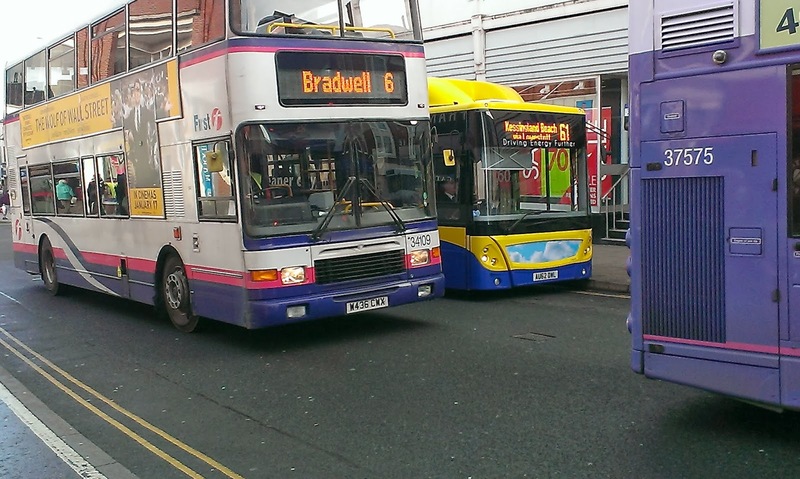 On duty were two of IB's ex P&R Transbus Darts. They say you don't have to be mad to be a transport enthusiast but my word it helps. That must be why on a foggy day where temps refused to get much above freezing I was standing at Market Gates for an hour watching the comings and goings. I was hoping to get on an Olympian but that wasn't to be, despite seeing 34186 come in on the 7. It went back to the depot and failed to re-emerge. Now when I first started venturing up that part of the world someone told me how rare it was to see a decker on the 6 or 7. Well today I saw three different ones and I apologise in advance for the quality of the pics - today was not a good day for taking pics with dazzling headlights and a very thick atmosphere. It just goes to show that it is never over till the fat lady smashes the wine glass and you should never say never etc etc. We all thought the days of coaches on the X1 shorts were things of the past. 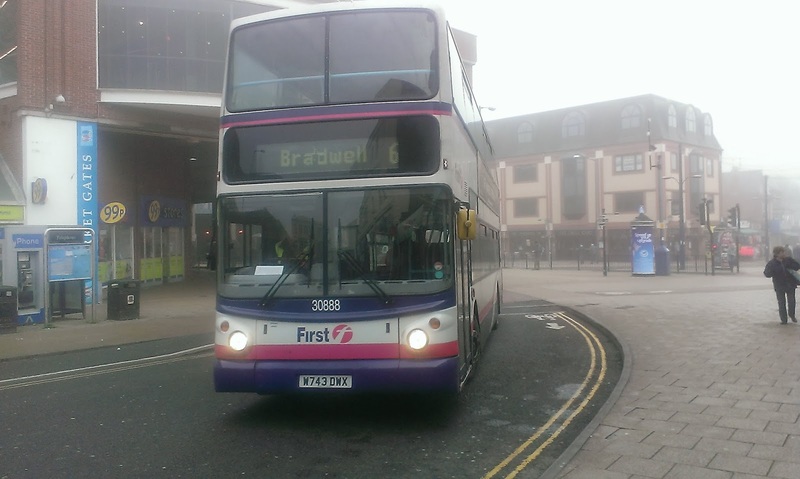 Nope - both 20514 and 20515 were back on there today so it seems to be a case of as you were! 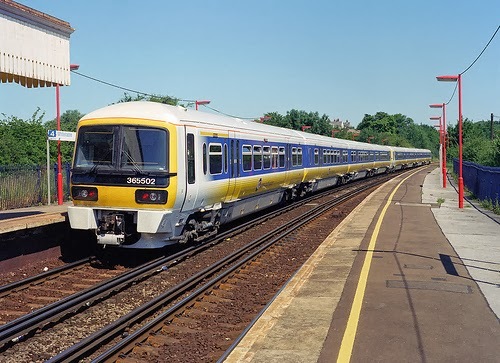 Personally I like seeing them on there and think they should be repainted into the new livery. 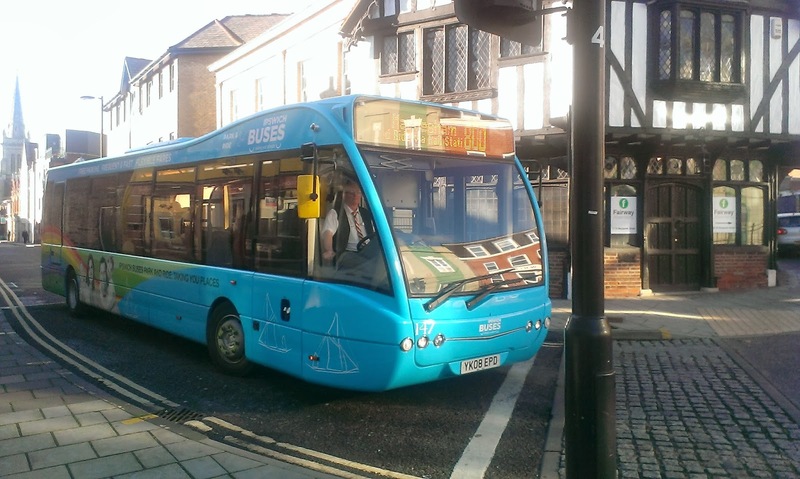 Missed from the round up yesterday was the news that Ipswich Buses have been doing some work to their Park and Ride Optare Versas./I travelled on a couple last week and you can really feel how much better they are compared to when they first arrived. Smoother, firmer and quieter. However some bright spark who obviously travels to work by car has decided that a P&R service would benefit from on board announcements. I mean do passengers REALLY have to be told 30 seconds after leaving Martlesham that "the next stop is Kesgrave High School"? Do parents on the school run drop their little loves off at the P&R terminus and tell them to get the bus the last half mile? 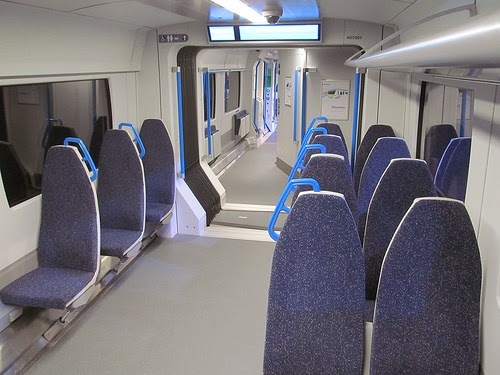 Anyway that is my gripe of the day - onboard announcements are NOT needed on P&R buses, but apart from that well done IB for the obvious other improvements you have made to that fleet. I have been neglecting to report news so here is a round up, not necessarily in chronological order! Carters have acquired a new Olympian but under unfortunate circumstances. 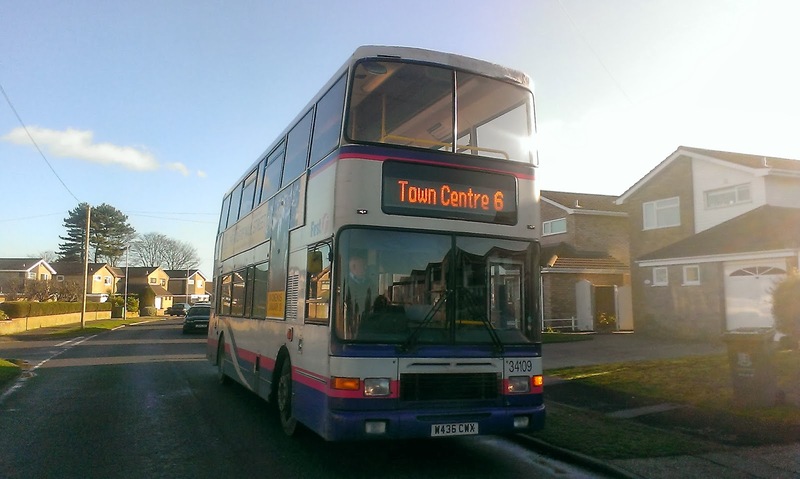 A few weeks ago I posted a pic of ex Stagecoach Olympian L679 HNV asking for its history. 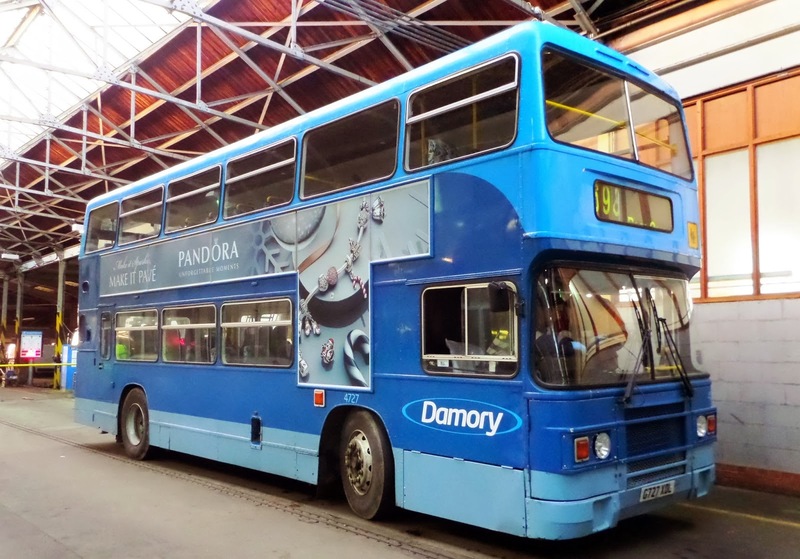 Well sadly that vehicle has been written off - circumstances unknown - and Carters have replaced it with ex Damory Olympian G727 XDL, still in Damory livery. 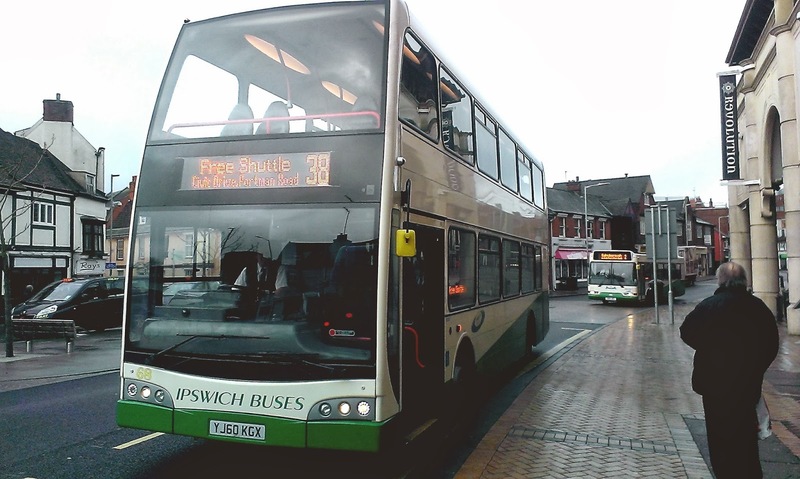 Galloways have decided to withdraw their service 110 from Ipswich to Claydon. 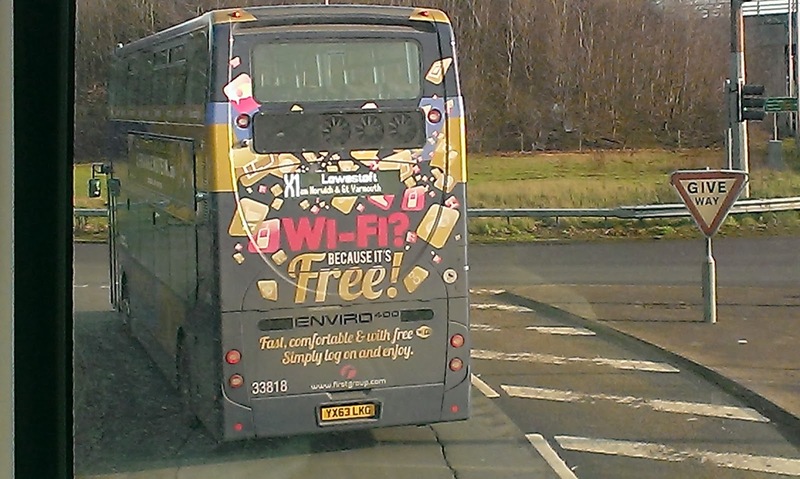 This came as a surprise to me as whenever I have seen it the bus has usually been pretty full. 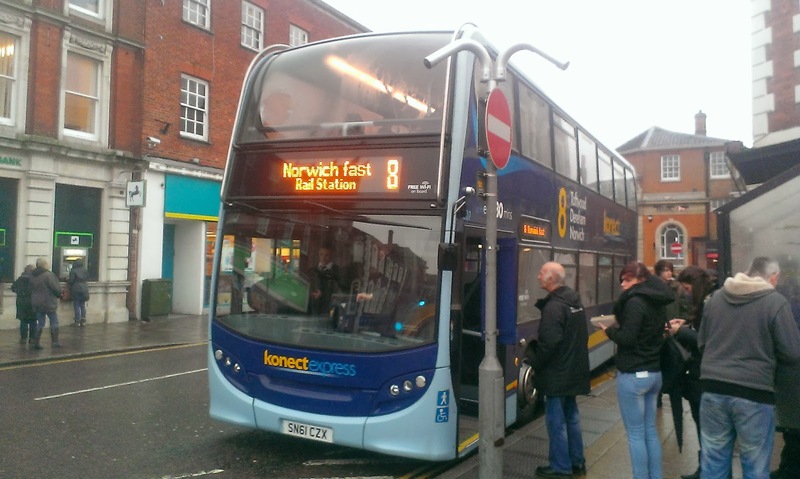 However First have stepped in and from 3rd February will be incorporating a new service 89 into their 88/88A Ipswich - Stowmarket route which will cover the 110 route to Claydon. It will be interesting to see if the extra passenger numbers can be absorbed into what is normally quite a busy route anyway. 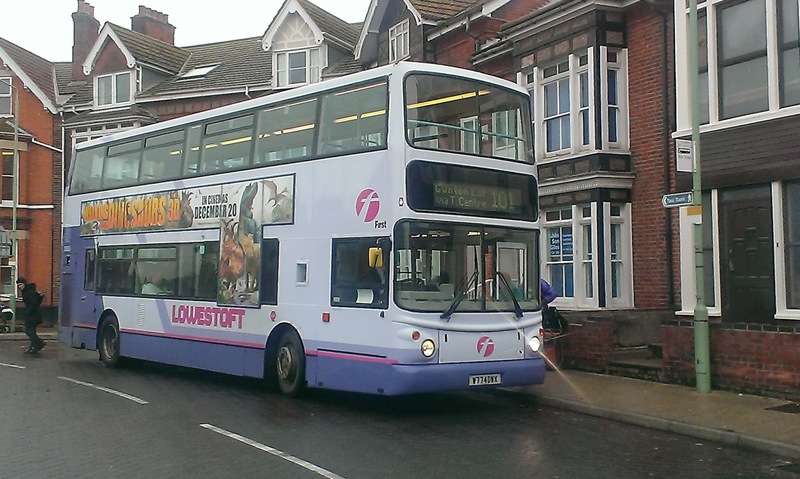 Suffolk on Board website announce that Ambassador Travel are withdrawing their service 607 from Gorleston to Lowestoft via Oulton. 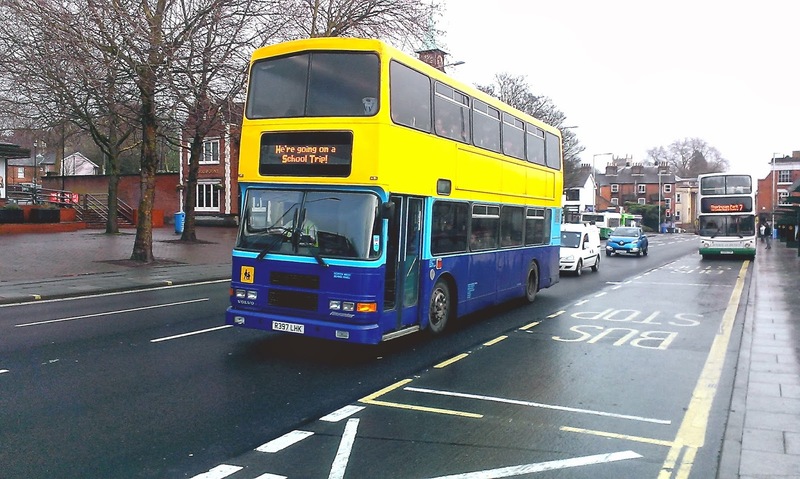 The last service will operate on 22nd Feb. From 24th Feb Anglian's service 60 will be amended so some journeys will serve Blundestone and Lound which will result in an amended timetable. 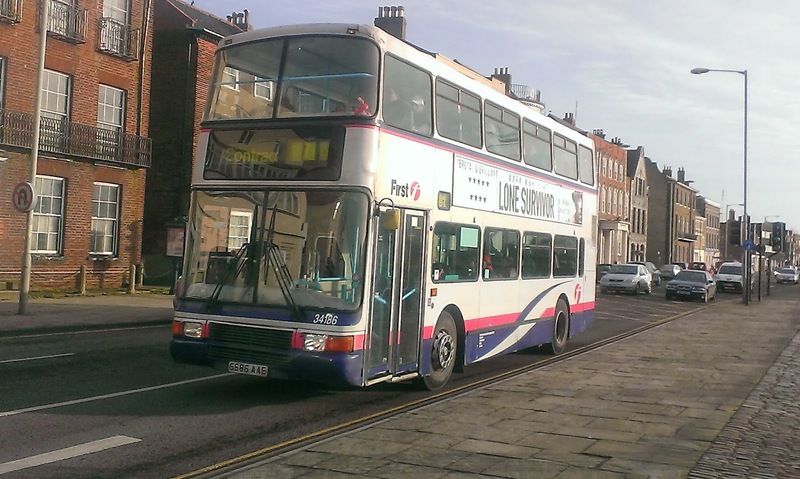 One of my regular readers would not forgive me if I didn't include the news that ex Jersey Enviro E400 33423 SN60 CAA has finally been relinquished by Kings Lynn, and after MOT will be repainted into First colours. It remains to be seen just how often she is pressed into service on the X1 as cover. I think she'll look pretty good and rumours that Cameron is already camped outside Caister Road depot to be the first to see her return are unconfirmed! Thank you to all who have sent in pics of Olympians for the forthcoming special posts. So far I have 65 photos. What I would like is pics of FEC Olympians in their former colours for original owners. I am particularly keen to get some pics of the F17* LBL series in Q-Drive of Bracknell livery, which is where they started their life. I have a feeling the Olympian specials will become a long lasting regular feature and I am even thinking of including a regular Reader's Olympian Memories feature. Let me know what you think. In the meantime keep the pics coming as even the ones that I end up not using I'll put into a special Olympian gallery with full credits on my Flickr site. 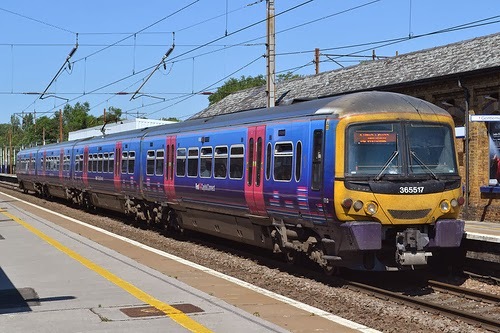 First Capital Connect have announced the introduction of the first class 365 Networker to be refurbished on their Great Northern lines between Kings X/Peterborough/Kings Lynn. 365517 has been completely upgraded both inside and out, and given a new paint job which is neutral to accommodate the new franchise name later this year. Over the course of the next two years all 40 units will be done to include new toilets, announcement systems, and wheelchair bays. These units have a place in my heart as the first 16 units were loaned to Connex Southeastern and I worked them regularly as a Conductor until they returned to join the rest of the fleet in 2003 (I think) when the 375's were delivered to Soiutheastern. Really nice trains with a great soundtrack and go like the clappers! 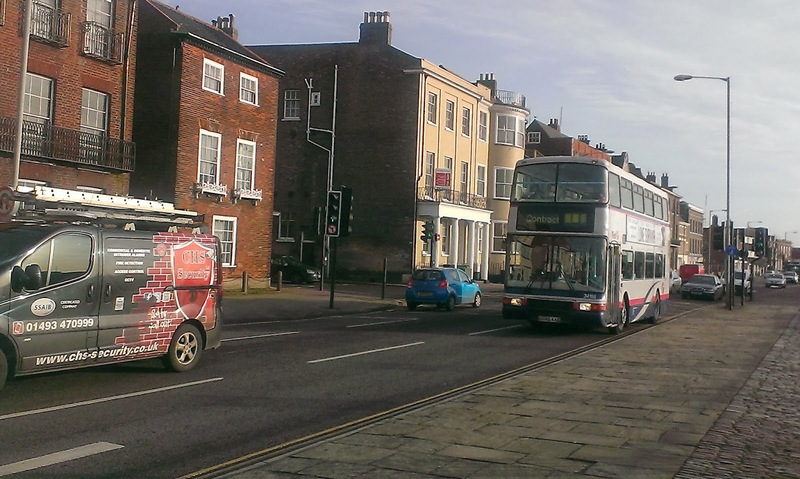 I popped up to Lowestoft this morning to meet a chap who has another blog called the East Norfolk Bus Blog - some of you might have heard of it!! Roy, it was a real pleasure and I know we could have spent far longer than the couple of hours we did chewing the cud. Anyway while we were there it was if the Bus Gods decided we needed some subject matter and so provided it, firstly in the shape of ALX400 30900 working the 101 Lowestoft town service. Another decker on the 101's - it's becoming a habit. As if that wasn't enough shortly after Great Yarmouth President 32208 came in on the X2, reloaded and set off back to Norwich. No idea what she was doing on the X2 but made for a couple of good pics. Incidentally why no Yarmouth vinyls? 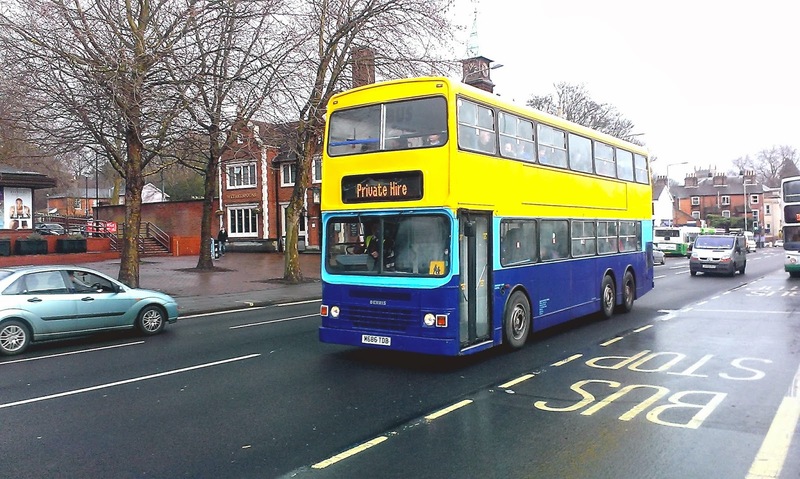 After I mentioned yesterday that I had been waiting sometime to get a decent pic of Anglian 100 with her all new yellow front, Roy Northcott from East Norfolk Bus Blog got in touch with a pic he took last week of her. Many thanks for the pic, Roy, which of course remains his copyright. On a similar theme I am planning to do a series of Olympian specials once the last Yarmouth Olympians have finally been withdrawn, so if anyone has any pics of Olympians they would allow me to use that would be great. They can be local Olympians both when here and in former pastures, Olympians that hold personal memories regardless of location - I'll be including some that I have driven, or just Olympians that look good. It will truly be the end of an era and I think it should be recognised. Btw by my reckoning 34109 is the only Olympian in regular public service (public meaning anyone can get on it, not school or other contract) in our region north of Ipswich. If anyone knows any different them please let me know, with times and locations if poss. I am delighted to report that Anglian have amended their destination displays on the 7/61 to show they are connected through routes now. 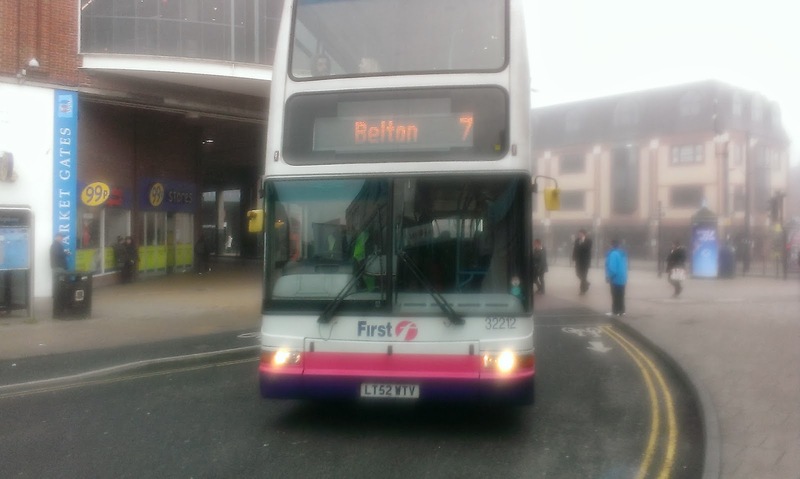 Last week I was critical of the fact that although the buses carried on from one route to the other this was not reflected in the destination screens. 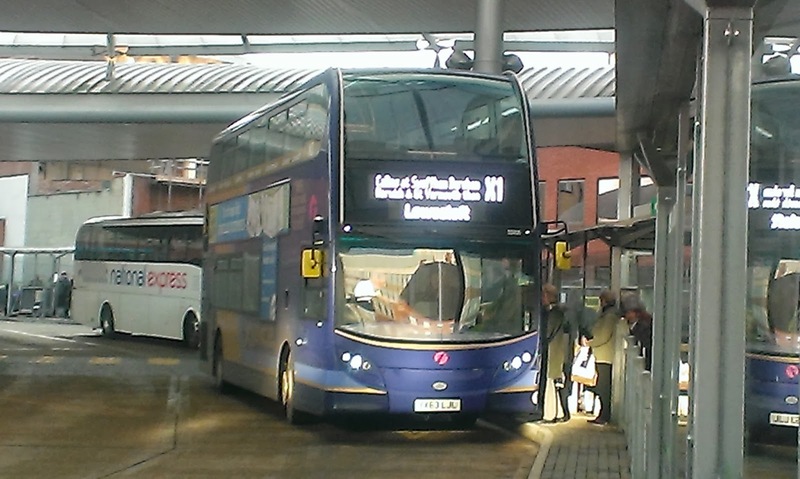 Well now it is as you can see from the pic of Scania OmniCity 454 AN61 LAN at Market Gates today. I have no idea if it was the result of my post ,last week that prompted the change but my ego needs a massage so I'm going to assume so! Contrary to reports elsewhere the last Great Yarmouth Olympian 34109 W436CWX has NOT been withdrawn, in fact I enjoyed an incredibly comfortable journey on her today on the 6 to Bradwell and back. 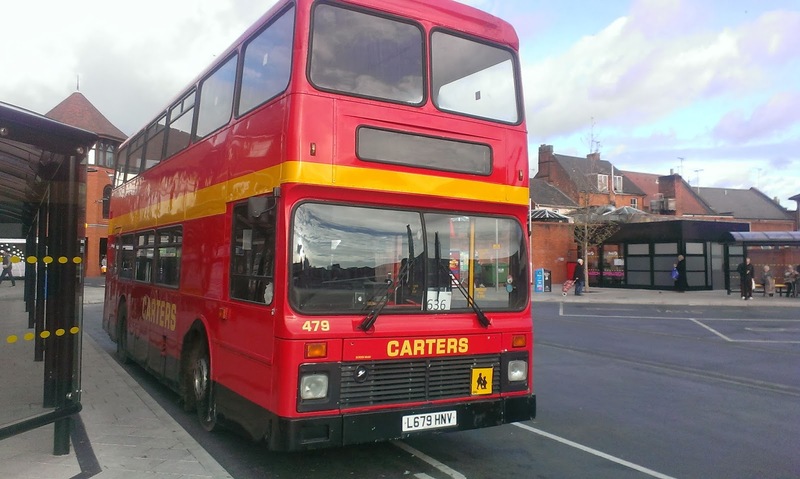 So to clear up the confusion after I alighted I took a trip to Caister Road depot to try and find out the official position. 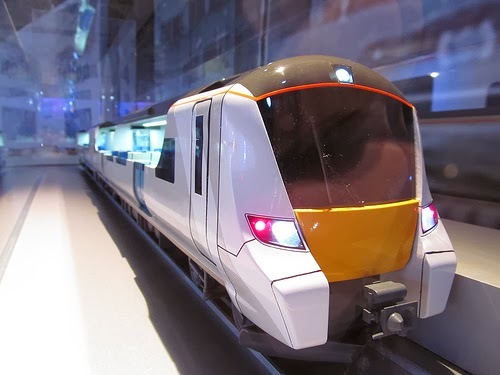 This is what I was told by the Engineering Manager via the member of staff I saw ask him - 34109 is scheduled to be withdrawn next week, but that is subject to change and could be extended if requirements dictate. Also 34108/12/13 remain in reserve and could be pressed back into service too if required. 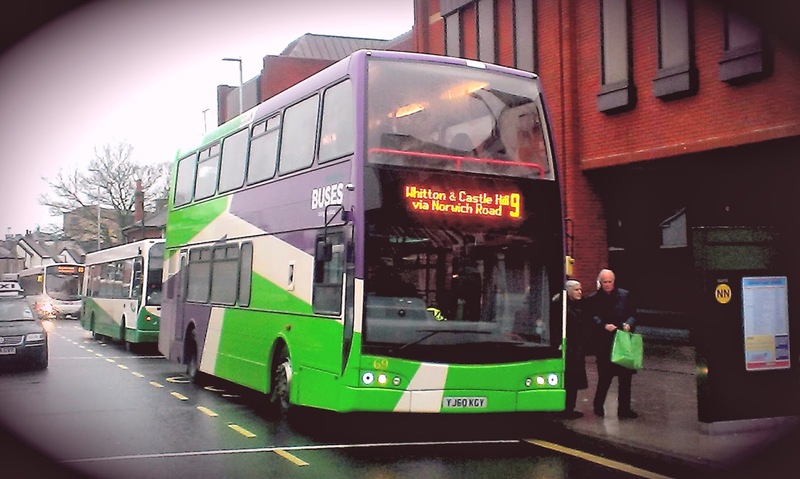 Having criticised First's Enviro 400's recently it is worth noting that 34109 does not have a rattle on her. The driver I spoke to at Caister Road had driven her this morning and agreed with me whole heartedly that it is a crying shame the Olympians are going. UPDATE: East Norfolk Bus Blog reports that another Olympian 34186 S686AEE was out on BM contract work this afternoon so she is still clinging on to life too! 34109 looking great at Bradwell. Thanks to the driver for waiting for me to take the pic. A bit off our patch I know but Grace, who is excelling herself this week, alerted me to a news report today about a fleet of Streetlites in Milton Keynes that are 100% electric, and charge themselves up at each end of the 15 mile long route. You can see a full report and video here. 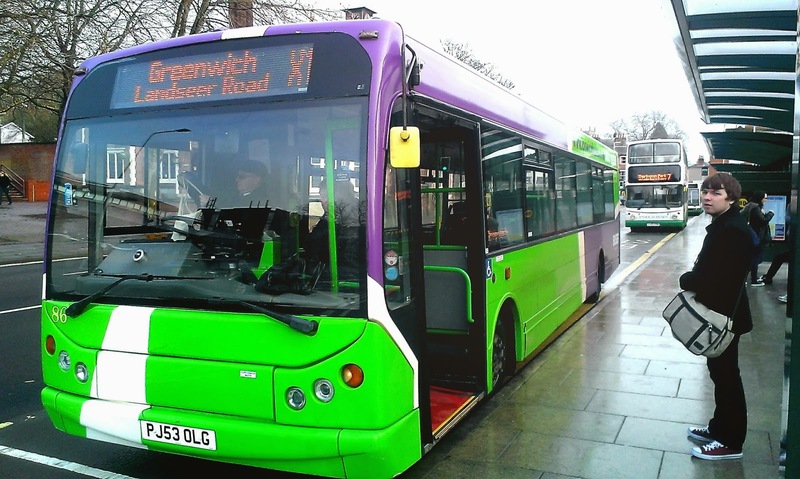 I then did a bit of digging and saw that acoiuple of weeks ago Transport for London launched its own fleet of electric vehicles on the 507 & 521 Red Arrow routes, formally the domain of bendy buses. A video can be seen below. Before I begin this post I must emphasise that I am not affiliated to any bus company and I praise or criticse any company when I see fit. Opinions are mine, and are there to be agreed with or not as anyone sees fit. Yesterday, after a few weeks avoiding the new X1 Enviros because of interesting activity on the X1 shorts I thought it about time I saw how they were settling in. So as part of my loop yesterday I caught 33807 from Yarmouth to Lowestoft and to say I was surprised is an understatement. 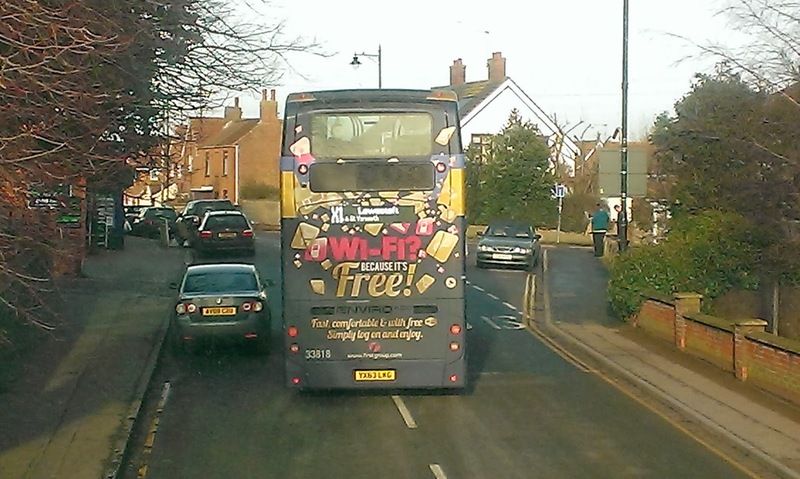 The rattling and general noise for a bus 3 months old was abysmal. But rather than jump to conclusions and start criticising First immediately I thought I'd spend today comparing E400's to get a better picture. 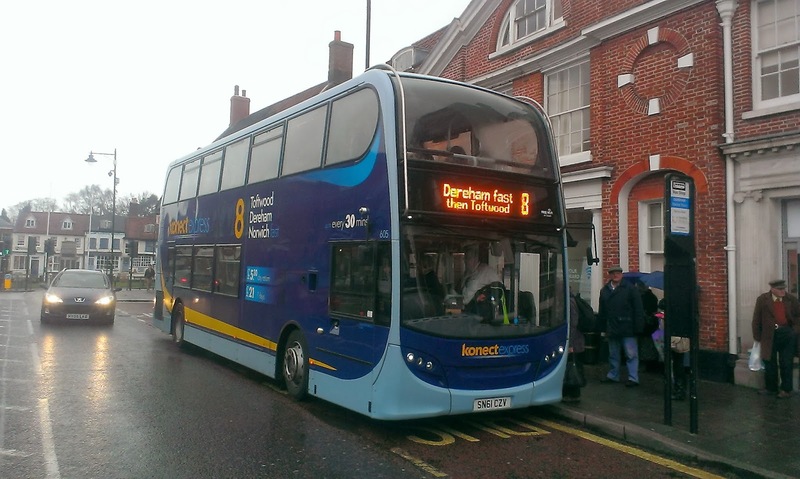 So I did two round trips from Norwich to Dereham, one on Konect's 8 Service, the other on the X1. 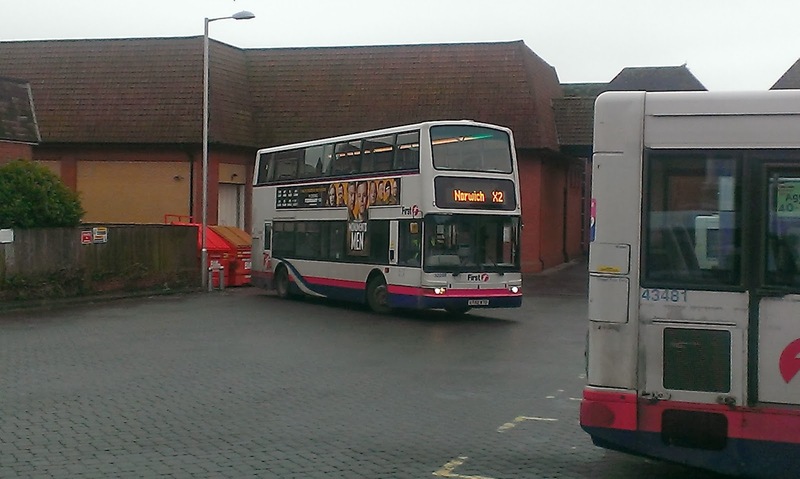 I also thought it prudent to travel in from Beccles today so I could sample a couple of the former X1 B9's. So of course round the corner came ALX400 30900 to kick that idea into touch! But having said that apart from the well documented God awful seats she gave a pretty decent ride, was warm, smooth and very few rattles Not bad for a 15yo vehicle. 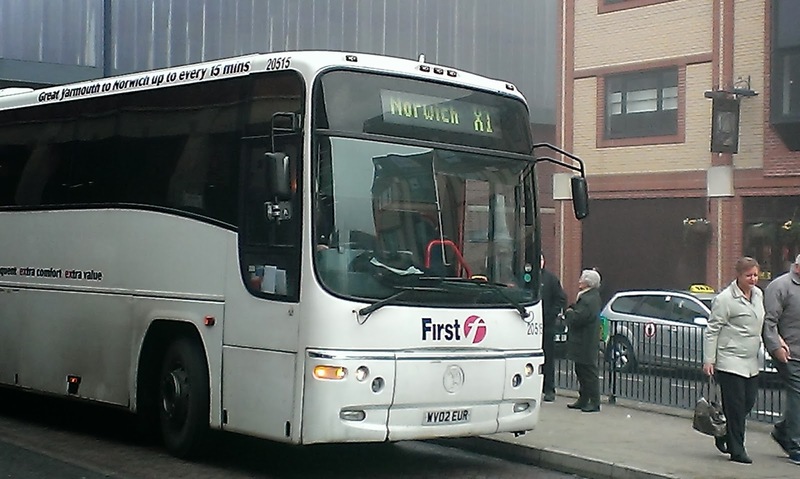 So at Norwich I boarded Konect's E400 608 SN61 CZY and settled down for the trip to Dereham, where I immediately caught 607 SN61 CZX back to Norwich. Both gave really impressive rides, were warm and comfortable, texting on my phone was easy, and were quiet - no intrusive heating noises and I was really impressed. 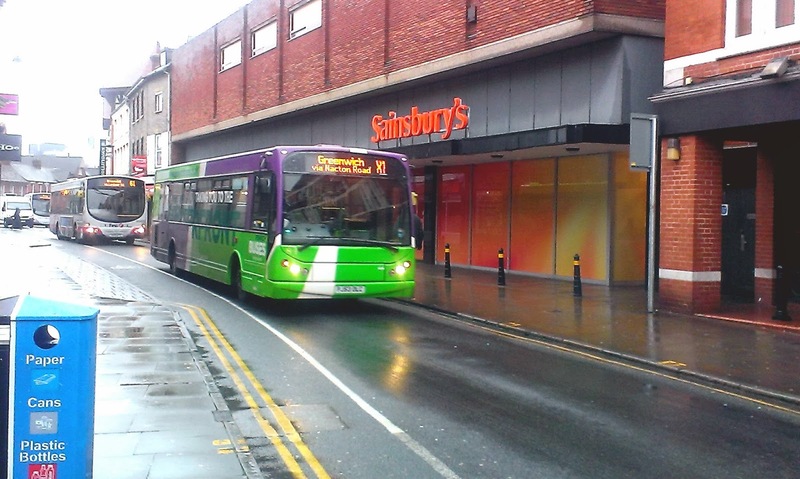 Kudos to the driver on the way out who seemed to know First Norwich route 11 better than the First driver, and we pulled back and waited for the First bus to cut across us at a roundabout, turning right from the left hand lane. Quality! 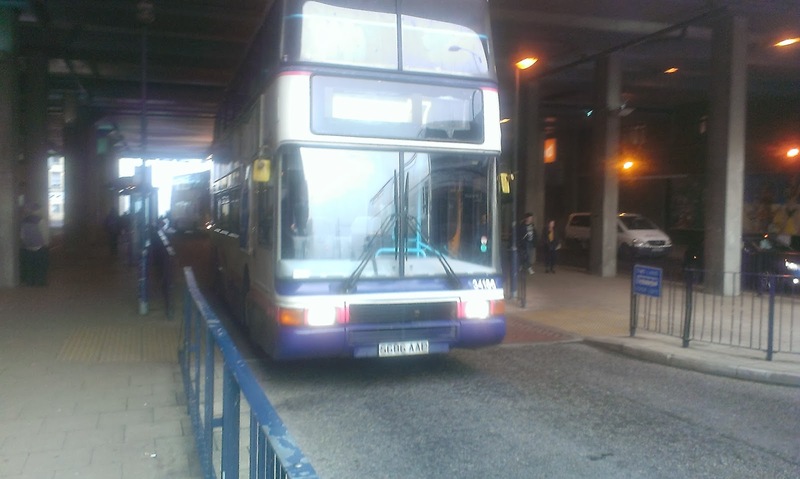 So after a lunchbreak I did the journey again, this time getting X1 E400 33814 YX63 LKC on the outward journey, and 33806 YX63 LJU on the return. Oh dear. I'm afraid to say yesterday on 33807 was not a one off. In the space of 3 months they are rattling like vehicles 50 times their age. The heaters/air chill are so noisy upstairs it's impossible to hold a decent conversation. The seats are already subsiding so I could feel the frame of the seat which I couldn't when new. Those vinyls on the top deck windows are really restrictive and I know many people have complained about them. The ride is so rough texting is a real challenge and that next stop announcer (who taught him the wrong way to pronounce Gorleston) is enough to have you tearing your hair out. Heaven help anyone who wants to snooze as there is zero chance. The only thing they win on is top speed, which is a bit faster it seems than the Konect ones. So what can be drawn from this comparison. Why are Konect's 2yo E400's so much better than the X1's 3 month old vehicles. Did First buy the wrong vehicles for the route? 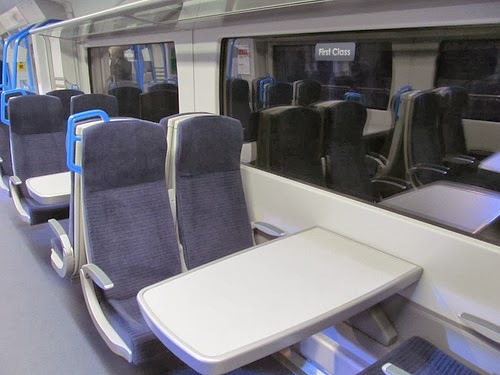 Did they go for cheaper option interiors? They knew the mileage would be demanding. This is their flagship route for heaven's sake - the longest bus route in the country and already they are showing signs of fatigue. Lord knows what they will be like in 6 months. If I had bought a brand new car that had deterioated that much in 3 months I would take it straight back and demand a refund PLUS compensation for the inconvenience. What I do know is it is not anything to do with the maintenance team at Kings Lynn. 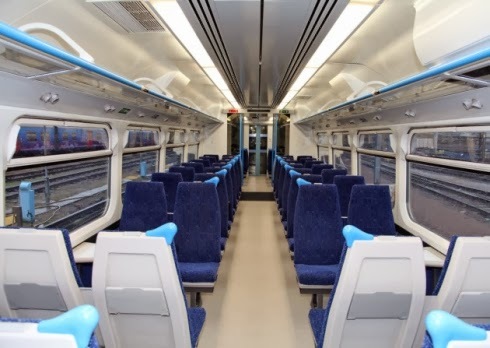 I did go back to Beccles on 37565 and it was embarrassingly less rattly, and also smoother and quieter than its replacements, which is a testament to the team at KL. The X1 is a fantastic route, great value for money and should have the best vehicles for the job with no corners cut. It is my sad duty to conclude that these E400's are not up to the job and won't last the distance anything like as well as the B9's did.